MHI :: PASADENA :: STAFF :: Deena Hassan, M.D. 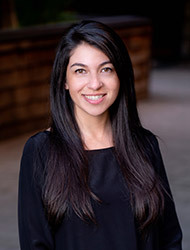 Deena Hassan, M.D. is board certified in adult psychiatry and board certified in child and adolescent psychiatry. She received her bachelors in neuroscience from Baylor University and graduated from medical school at Ross University. Dr. Hassan received her training as an adult psychiatry resident at the University of Southern California where she advanced into their Child and Adolescent Fellowship, serving as chief fellow in her final year. Dr. Hassan has worked extensively with many patients during her career. She brings warmth and her personal touch to each case, investing much of her own energy in cultivating others' inner strength and personal growth. Dr. Hassan has a particular passion for integrative psychiatry utilizing her skills to help develop lifestyle changes, strengthen patient meditative and mindfulness practices, as well as exploring alternative treatments with patients. Her characteristic holistic approach to mental health has been effective in improving patient wellness. She is adept at discussing psychopharmacology options while concurrently encouraging all of her patients to engage in psychotherapy with therapists. Dr. Hassan hopes to be able to help her patients accomplish their mental health goals and looks forward to continue serving those living in the greater Pasadena area.